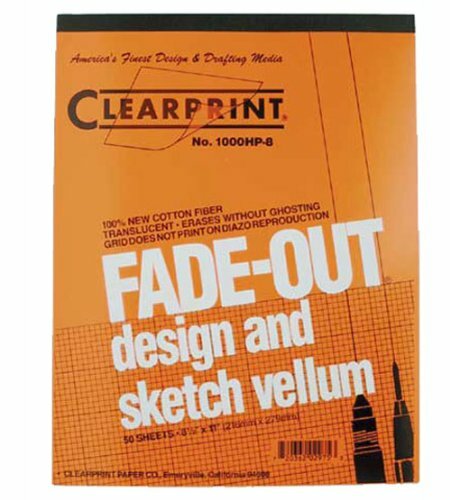 Use Clearprint 1000H Design Vellum Pad with Printed Fade-Out 8x8 Grid to produce professional drawings, tracings and artwork with translucent paper made of 100% new cotton fiber. This legendary Clearprint 1000H paper boasts acid-free archival quality, strength, erasibility without ghosting and redraw characteristics. 8x8 per inch faint blue grid is non-reproducible when scanned or photocopied. Pad is ideal for use with ink, fine art materials and traditional drafting products. It is transparentized without solvents to produce a permanent transparent drawing surface, which is also printable in laser and inkjet printers. Made in USA. 16 lb. 8-1/2 x 11 inches, 50 sheets. View More In Tracing Paper. If you have any questions about this product by Clearprint, contact us by completing and submitting the form below. If you are looking for a specif part number, please include it with your message.